This hugely flavorsome food takes all the wholesome goodness of New Zealand’s finest natural ingredients and combines them in one super-nutritious recipe. For decades, New Zealanders have been feeding their pets Brushtail and Venison for their nutritional value, hypoallergenic properties and great taste. 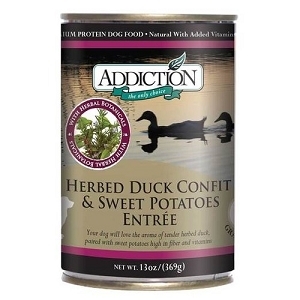 Combined with Active Manuka Honey, renowned for its healing properties, Addiction brings to you an exquisitely nutritious and delicious formula for your dog. Wild Brushtail (Trichosurus vulpecula), a marsupial found in large numbers in New Zealand, contains the highest levels of Omega 3 & 6 Fatty Acids of any red meat. Brushtail is not native to New Zealand and eats only the best berries and foliage, destroying forests and wildlife. Unlike farmed animals, Wild Brushtail is free from antibiotics and artificial hormones. By feeding this food, you are not only helping to conserve New Zealand's plant and animal life but are also providing your pet with a nutritionally superior meal that promotes wellness and vitality. 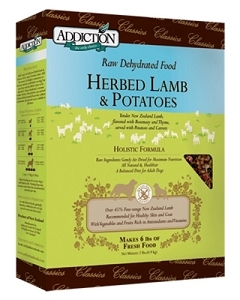 Addiction ensures that your dog is given food that is closest to what is found in nature by using only the freshest and most ideal ingredients for a healthy dog. This formula includes Diatomaceous Earth, a natural fossil shell flour known to fight parasites. Other premium ingredients also include Potatoes, Carrots, Papayas and Spinach - all of which contribute to your dog's vitality. 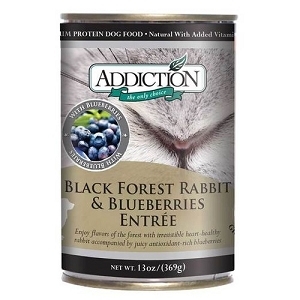 Addiction New Zealand Forest Delicacies is formulated to meet the nutritional levels established by the AAFCO Dog Food Nutrient Profiles for All Life Stages. 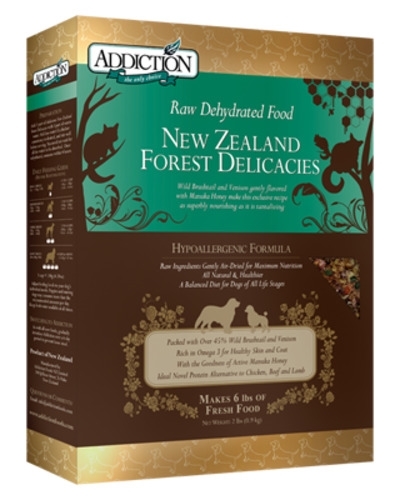 Add 1 part of Addiction New Zealand Forest Delicacies with 1 part of warm water. Add less water if a thicker consistency is desired, and stir well before serving. You need not wait for all the water to be absorbed. Once rehydrated, consume within 4 hours. Adjust feeding levels to your dog's individual needs. Puppies and nursing dogs may consume more than the recommended amounts per day. Keep fresh water available at all times.